Dutch Bangla Bank HSC Scholarship: Every year Dutch Bangla Bank is provide scholarship among the HSC students for their brilliant result. HSC result has been announced 9th August 2015. Dutch Bangla Bank starts their scholarship program 11th August 2015 in this year. Last year Dutch Bangla Bank was distributed one hundred two core taka among the poor meritorious students and also celebrates their twelve years program. Last year almost more than two thousand students were getting this scholarship. NB: Those students who have got CGPA 4.80 without 4th subject in the City Corporation and CGPA 4.50 without 4th subject out of City Corporation they are eligible for this scholarship. Those students who already get scholarship from any other non-government fund they are not eligible for scholarship. HSC exam given from any rural area educational institute are getting almost 90% scholarship & girls students are getting 50% of total scholarship. Selected student must be admitted any public university in this year. Here you can download Dutch Bangla Bank HSC Scholarship Form Result 2015. 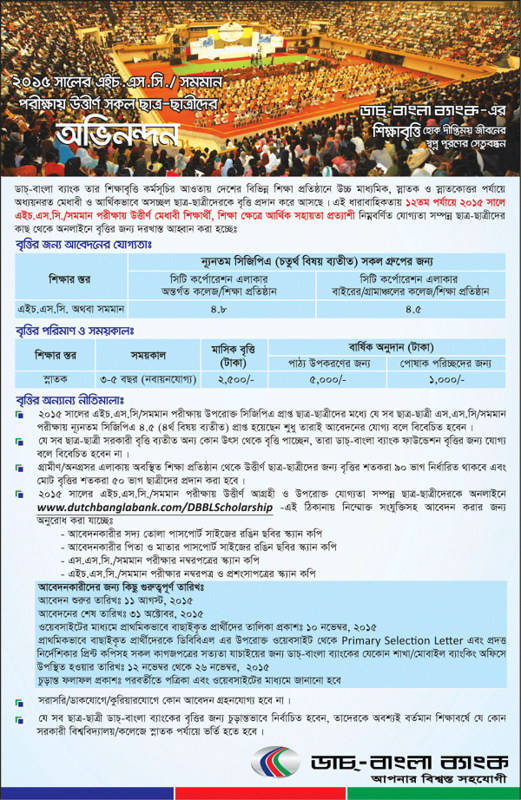 Now Dutch Bangla Bank HSC Scholarship Notice 2015 has announced. Today 11th August (Tuesday) 2015 will be the starting date of application in Dutch Bangla Bank HSC Scholarship Result 2015. Eligible candidates have to apply within 31st October, 2015. DBBL HSC Scholarship Result.